FILE - Migrants arrive at the Greek port of Piraeus, near Athens, in December. A new security report says that, since May, 43 suspected jihadists have been caught entering Europe disguised as refugees. The U.S.-based Terrorism Research & Analysis Consortium (TRAC) reported this week that 41 Islamic State-linked militants and two from rival Jabhat al-Nusra, al-Qaida's affiliate in Syria, were apprehended while posing as refugees. Some of them used false passports, TRAC said in a security update for commercial clients that it shared with VOA. Nineteen of the 43 jihadists were caught in Turkey but the rest made it into the European Union before being identified, reported TRAC, a consultancy of academics and analysts. The documented cases of jihadists trying to sneak into Europe is adding to the alarm of European intelligence services and politicians struggling to cope with hundreds of thousands of newcomers. Some 36,000 people – including war refugees from the Mideast as well as mainly economic migrants from Africa – entered Europe just in the first three weeks of January, according to the International Rescue Committee, a humanitarian aid organization. Also last week, French Interior Minister Bernard Cazeneuve warned that IS has formed an entire "industry" out of making false travel documents, using passports stolen in Iraq, Syria and Libya. European intelligence officials say they’re concerned if even a few IS members slip into their continent unnoticed. But they are especially alarmed at the prospect of returning European-born IS fighters who have been battle-hardened and possess local knowledge and familiarity. December brought the arrests of several suspected Islamic State militants, according to the TRAC security update. These included a suspect arrested by the Greek coast guard, initially because of "involvement in a migrants’ trafficking ring." "The coast guard found ‘suspicious’ pictures and videos on his mobile phone, with flags and symbols of IS as well as of heavy armament and battlefields in Syria," TRAC reported. On December 10, Finnish police detained two refugees: 23-year-old Iraqi twin brothers suspected of involvement in a June 2014 IS massacre of up to 1,700 unarmed Iraqi Army soldiers near Tikrit. The brothers were identified from an Islamic State video boasting of the killings, TRAC said. On December 16 in Austria, the research consultancy found, two Frenchmen were arrested in Salzburg after posing as refugees and using fake Syrian passports. 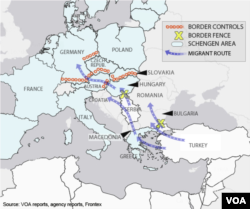 They had traveled from Greece through the Balkans, entering Austria in October. TRAC said the men are suspected of having entered the country "together with members of the cell who carried out the November 13 attacks in the French capital that killed 130 people." On December 17 in Germany, "31-year-old Syrian Leeth Abdalhmeed was detained at a refugee shelter in Unna-Massen in North Rhine-Westphalia," suspected of IS ties, the consultancy said. At the time, German newspaper Die Welt reported that the man had arrived at the International Red Cross-operated camp December 2 under a different name and with several family members. 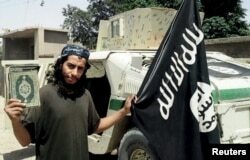 FILE - Belgian national Abdelhamid Abaaoud, shown in an undated photo published in the Islamic State's online magazine Dabiq, was believed to be the mastermind of the deadly attacks on Paris, Nov. 13, 2015. He bragged of slipping back into Europe from Syria. The interception of jihadist infiltrators feeds into public fears in Europe about more terror attacks, increasing pressure on politicians to curb the entry of asylum-seekers – which in turn helps terror groups radicalize disaffected European Muslims. A case in point: Abdelhamid Abaaoud, identified as the mastermind in the deadly November 13 Paris attacks and killed in a French police raid days later, had bragged publicly that he had no difficulty traveling several times from Syria to his home in Brussels. He noted that despite an international arrest warrant, border guards failed to recognize him. At least two of the Paris attackers are believed to have re-entered Europe using fake Syrian passports. IS hasn't lost any opportunities to fuel public fears and a tabloid media hue-and-cry about the dangers lurking among refugees in Europe. One jihadist smuggler told the American news site Buzzfeed last year that the terror group "had sent some 4,000 fighters to Europe." European intelligence officials have told VOA they doubt the figure is that high. One of the ironies of the European migrant crisis is that many of the men and young boys making the perilous journey across harsh terrain and stormy seas are doing so to flee jihadist gangs such as the Islamic State group in Iraq and Syria, the Taliban in Afghanistan and al-Shabab in Somalia. Jihadists focused on soft targets don't need many accomplices or the logistical backup needed for more complex terror plots. In the face of terrorism going for "low grade" and commonplace targets, Western governments are hard-pressed to offer security or even reassurance that they can foil random attacks against targets that lack obvious symbolic significance. Last week, Europol, the EU's law enforcement agency, warned that IS had set up secret training camps across Europe to prepare fighters to carry out "special forces style" attacks. In a statement, Europol said: "In selecting what to attack, where, when and how, IS shows its capacity to strike at will, at any time and at almost any chosen target. The Paris attacks on 13 November 2015 indicate a shift [toward] a clear international dimension of Islamic State to carry out special forces style attacks in the international environment." A British intelligence official told VOA that just a handful of terror operatives can cause mayhem, citing the Paris attacks as an example. He recalled a brag by members of the Irish Republican Army, the Northern Ireland terror organization that waged a long struggle against Britain into the 1990s. "The IRA used to say: 'You have to be lucky all the time; we only have to be lucky once.' The same applies with the Islamic State."